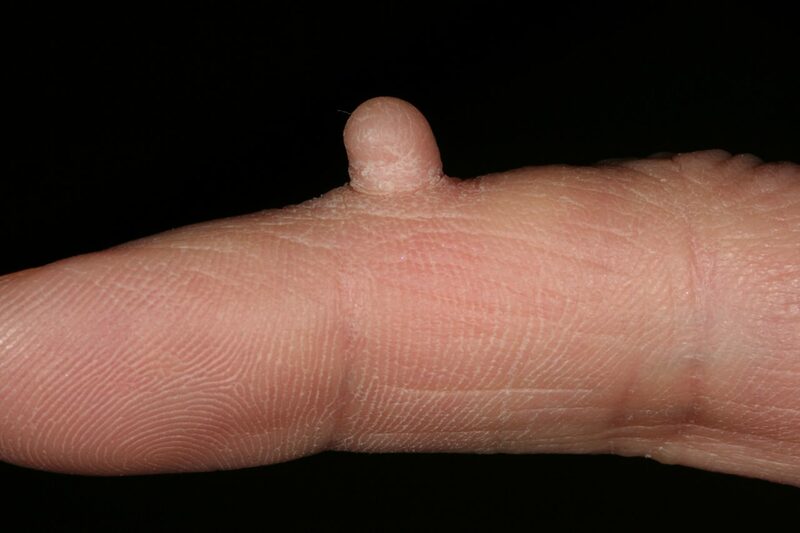 An acquired digital fibrokeratoma, also known as an acral fibrokeratoma because it can also arise on the fingers, toes, knees, and soles in addition to its most common location: the fingers. It appears as a single pink or flesh-colored growth that resembles a horn or dome with a collarette – a term that describes a collar of peeling or scaly skin around the edge of a lesion that gives it a classic “moat” appearance. Most acquired digital fibrokeratomas are smaller than one and a half centimeters in both height and diameter. It is unknown what exactly causes an acquired digital fibrokeratoma to appear, though a popular hypothesis attributes its development to minor trauma in the area prior to the lesion’s occurrence. Thankfully, acquired digital fibrokeratomas are benign, do not require treatment, and presents with no symptoms besides the appearance of the growth. If removal is desired for cosmetic purposes or if it frequently becomes irritated by clothing and/or regular hand use it can be treated via simple excision – an easy procedure that can be done in your dermatologist’s office that will remove the lesion with a low rate of re-occurrence. While acquired digital fibrokeratomas are benign it is important to have all new and persistent skin lesions, growths, and changes evaluated by a dermatologist. Your dermatologist may biopsy your lesion and send it to a lab in order to make a diagnosis and to rule out other more serious conditions that can be mimicked by an acquired digital fibrokeratoma. This procedure is very similar to a simple excision and can be combined with it.